We decided to stay on the island of Lido, instead of mainland Venice, as it was significantly cheaper and quieter thanks to it being more of a residential area rather than touristy. It's only a 10 minute water bus journey into Venice and we were pleasantly surprised at how cosy we felt being away from all the noisy human traffic! I picked a lovely little boutique hotel 5 minutes away from everything and we were lucky enough to upgrade to a Penthouse looking over the canal which was beautiful, especially in the evenings. Unfortunately we didn't get around to checking out the beach on the island as we were too exhausted from wandering around every day but if we ever go back then we'll be sure to go, as well as visiting the other islands; Murano and Burano, which we also missed. Our bad! As you can see, our first day was quite bleak and rainy so we decided to venture indoors as much as we could, starting with this original bookstore called Libreria Acqua Alta. It's such a unique store with new and used books from all over the world being stored in everything from canoes, gondolas, tanks and even being made into furniture like these steps outside. I've never been anywhere like it and it was really cool to see how much of a tourist spot it is for the guy that opened it 10 years ago. If you've ever been to Venice, you'll know that Venetian masks are huge and there are shops on literally every corner selling them. Granted most of the shops have imported fake masks from China but if you hunt around like we did, you can find family run businesses that actually hand make and decorate them beautifully. Dane went to Venice with a mission to buy a legitimate hand crafted mask and we succeeded, not from the store that I'm showing in these pictures, but from a much smaller one that I wasn't allowed to take pictures in. It's currently being shipped over as it's really big and easily damaged but it's beyond stunning, a must have if you want to bring back an incredible souvenir. Finding a decent place to eat in Venice that isn't a tourist trap where the staff are standing outside trying to drag you in proved quite difficult but after a few hours of Trip Advisoring every place we walked past, we came across our favourite restaurant of our trip - Ristorante Trattoria Cherubino. The staff spoke exceptional English, were lovely and welcoming and the food was incredible. Dane went crazy over all the seafood, unlike me who stuck to my trusty pizza and pasta both times we went! ;) We mainly ate here and at another great local restaurant on Lido, but we also checked out a 'fast food' pasta in a pot place called Pasta & Sugo which I highly recommend if you're hungry on the go. Then we ventured into the Doge's Palace, which is pretty much the only proper touristy thing we did since the queues for the Basilica were ridiculous and we weren't hugely concerned with looking at churches all day. The Palace was the residence of the Doge of Venice, the supreme authority of the former republic of Venice which opened as a museum in 1923. I have about a million photos but I don't want to put them all up so not to ruin the experience for people that haven't been. The entire building, inside and out, is made so beautifully that even if you aren't interested in art, you'll still appreciate it. It took us a good hour to explore the entirety of it but I'm so glad we did. Venturing back outside during the beautiful sunshine, we came to Rialto Bridge which is the oldest of the four bridges spanning the Grand Canal in Venice. We only spent a short time here as the crowds were insane - there were tourists EVERYWHERE - taking pictures, shopping in the markets and generally just standing around taking in the view. We spent our last day lounging around Piazza San Marco, which is the main square of Venice. We'd already done most of our sightseeing and had our luggage with us for our flight in the evening so figured we'd just people watch and drink at the ridiculously expensive restaurants that charged you extra for good seating and live music. If you've got the leftover money like we did then why not, right? Although I don't recommend it if you're on a budget - it cost us 40 euros for a beer and a tiny cocktail as seen below! Overall, I would highly recommend visiting Venice if you're looking for a relaxing city break and ready to explore your socks off. We were there from late September until a few days into October and only had one day of rain, the rest of the days were 20-24 degrees, so I'm glad we didn't go prime time summer as it's supposedly baking and muggy af. 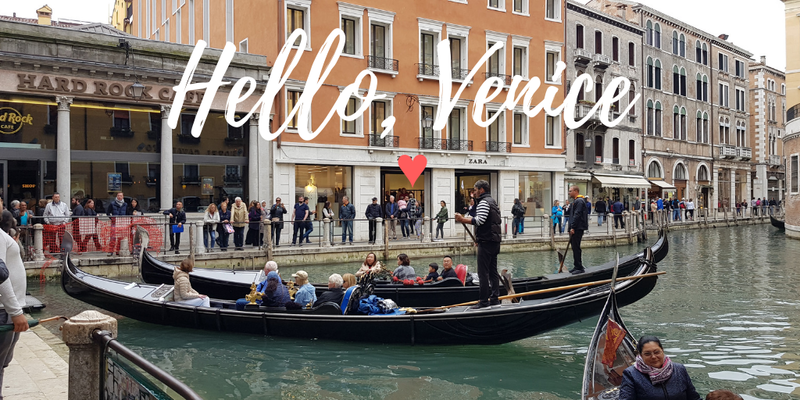 Depending on where you eat and stay, Venice can be expensive, but if you put Trip Advisor to work like we did, you'll be able to find some hidden gems and save your money. The water buses are a little difficult to get used to, I won't lie, but it's pretty much the only way to get around unless you shell out 80-100 euros for a gondola ride or walk the entire city, which I do not recommend, haha. Have you ever been to Venice? Did you like it? Let me know your thoughts below. These are some great photos of what seemed like a wonderful vacation! Thanks for sharing your adventure. Oh how I want to travel more. Your post makes me want to hop on a plane and head to Venice. I LOVED Venice! It's been way to long since I traveled there. All your photos made me want to plan a trip again soon. I love Italy! Great food, great wine, amazing cities! I have never been to Venice though but it looks like such an amazing city! Venice is actually on my bucket list with my husband! I've been to Italy twice and loved it so much! It's always nice to go on a couple's trip. It's fine that you haven't been on a couple's trip until recently. Venice is a lovely place! Love the level of details in the architecture. The pizza looks delicious, Glad you enjoyed your time out there!